Here we are, at the end of March. Finally, finally, the weather seems to be softening. We still have plenty of snow, as the following pictures indicate, but the days have been sunny and if not exactly warm, at least not quite as cold. The mud and grit have arrived, a little late. All those March snowstorms have put us at least two weeks behind where we usually are this time of year. All we can do is hope that the thaw is quick. Such a mess, inside and out. However, rather than brood about the mud, I’ll turn to the Kennebec River, which is beautiful and fascinating no matter the season. Here is a picture Clif took on Saturday. 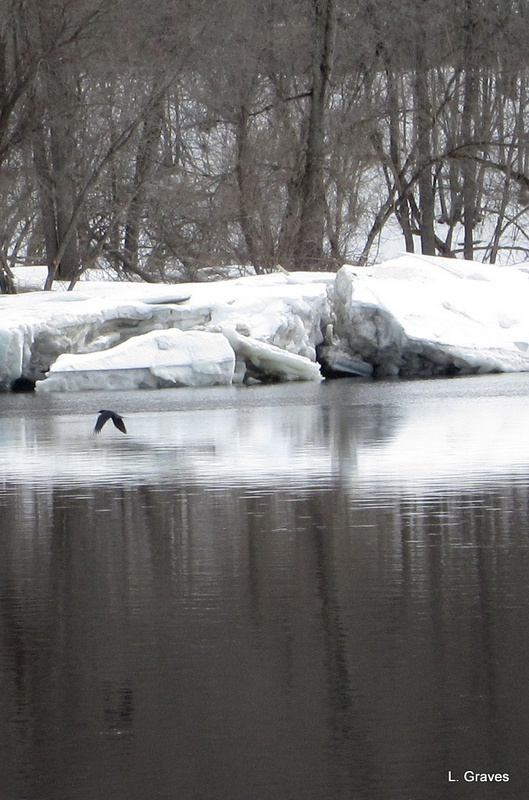 While the middle of the river flows clear, the edges are lined with some pretty impressive ice chunks. Here is a closer look. Luckily, a bird (a crow?) decided to fly by just as I was snapping the shot, and this will give you some sense of the scale of those massive ice chunks. I can’t even begin to guess when those chunks will be completely melted. Mid-April? End of April? I suppose it depends on how warm the weather is. Meanwhile, back at our little homestead, with snow-gauge Clif. Here is the front yard. 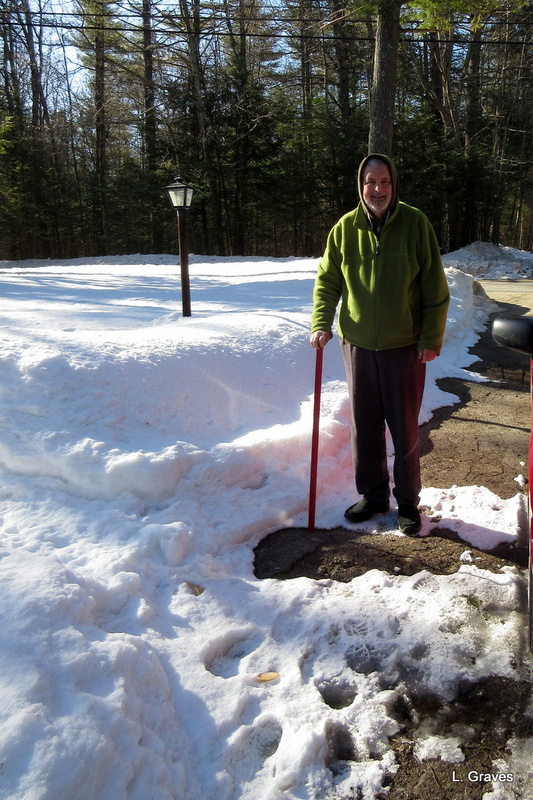 Still a lot of snow, but the driveway has begun to make an appearance. In our yard, that counts as progress. This week, I’ve also decided to add the backyard, and this, too, will be a regular feature. Over the years, our daughter Shannon has come up with a birthday wish—that all the snow will be gone from the patio before her birthday, April 22. 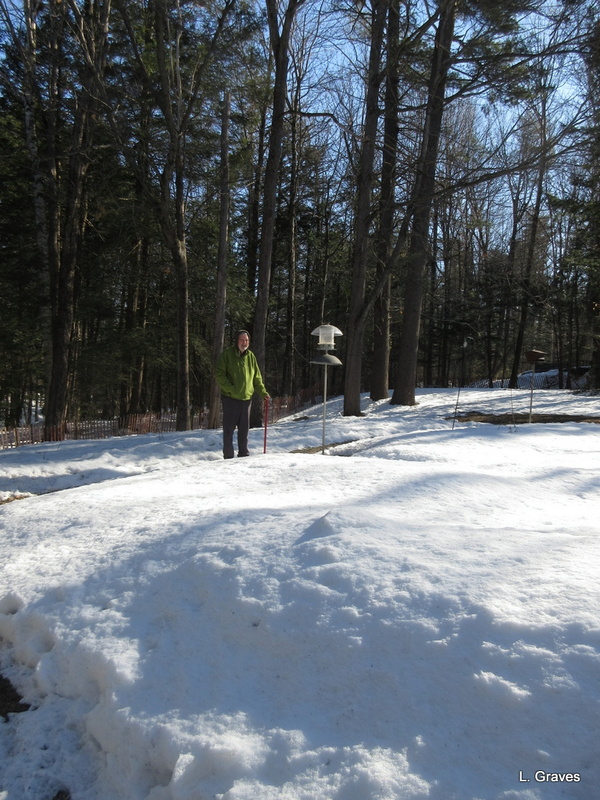 As you can see, the patio has a long way to go, and it looks very doubtful that the snow will be gone by April 22. Finally, here is a picture to show that although it looks as though central Maine is still in winter’s frozen grip, spring is slowly, slowly coming. Note the red buds on the tree. Perhaps the finches are even discussing when nest building should begin. Hope springs ever eternal! We shall see. Atta girl! We’ll all stay tuned to see if you get your wish. Goodness me, what a lot of snow, you document the seasons so well. Thanks, Susan! Yes, a lot of snow. Yup Laurie, same here, but it was nice today and expect to get above freezing all week. It will melt quick. Spring is coming, Kelly, ever for us northerners. Loving Snow Gauge Clif! Wishing you sunshine. Your wish has flown across the pond. We are indeed getting sunshine, and the snow is shrinking. Yay! Those huge lumps of ice are impressive….. If we could just find a way of airlifting them over to Australia, ( especially our region)where we are not getting enough water/rain this year. Wish we could! Drought is so awful. Fingers crossed that you soon get rain. That’s a lotta thick ice on the river! 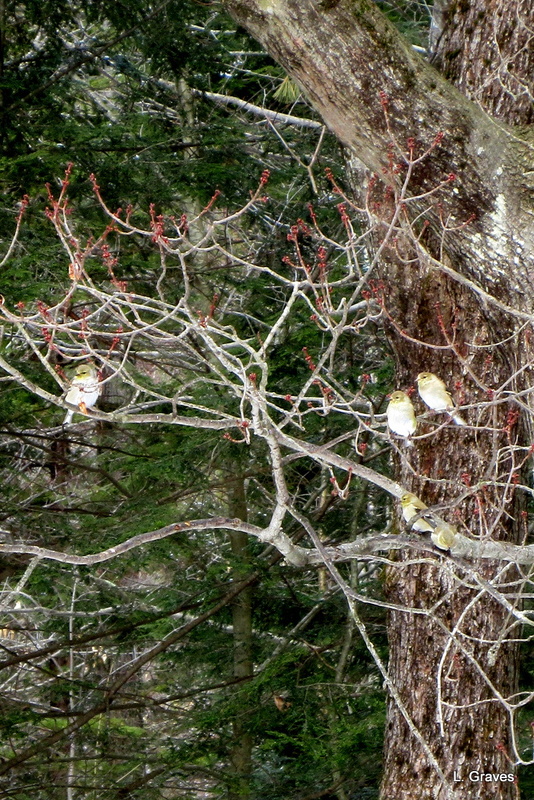 I like that last pic of the red maple buds and birds– very sweet. In my energetic younger days, it was not unusual for me to shovel snow onto bare patches to make it melt faster. I wouldn’t be that desperate now, but it’s a humorous indication of how badly I used to want the snow to disappear! I did the same thing! Oh, we Franco-Americans. Like you, I have slacked off as I’ve—ahem—matured. 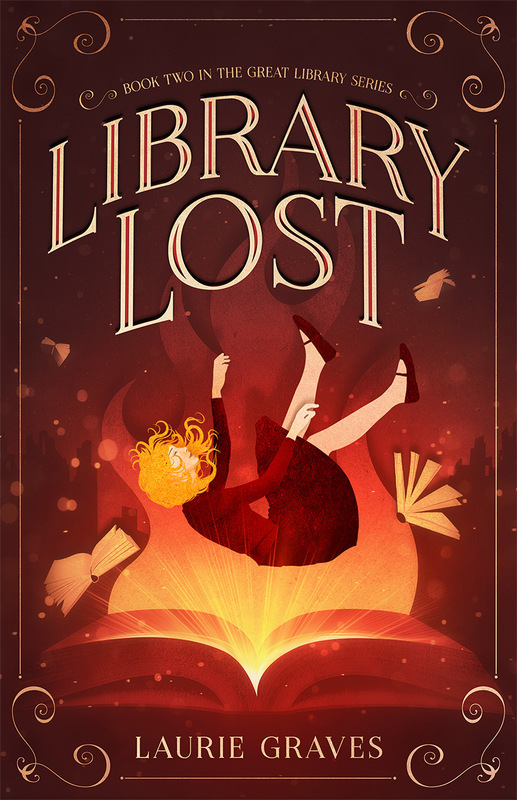 LoL – Me too! It works! That is a very handy snow gauge to have. Do you bring it in at night? I can see a definite improvement in the front yard but the patio…!! I hope the warmer weather continues and the snow disappears before Shannon’s birthday. Those ice chunks are enormous but the red buds on the tree *must* mean that spring is on its way! Melting is exactly what the snow did yesterday. “Shrinking” would also be a good word. The snow has visibly gone done, even in our shady yard. Spring is coming, Judy. We have no snow, so I should be grateful for that. In fact, it’s raining right now, which is good because it’s been cold AND dry this month. Do you get ice jams on the river? That’s always a big deal on the rivers here, and they often cause a lot of flooding. Hope you don’t have to worry about that! We do get ice jams, and as you mentioned, that can mean flooding. 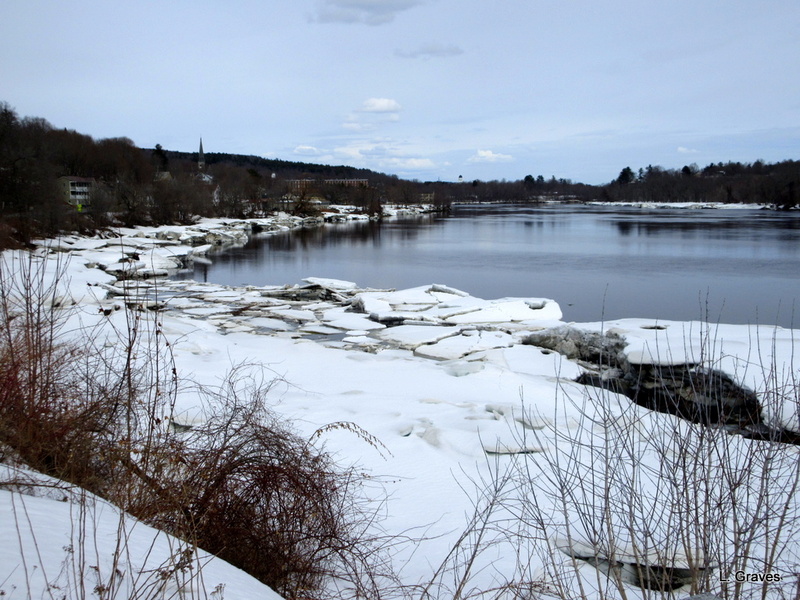 In central Maine, the ice chunks are along the edge of the Kennebec. Not sure how it is north of here. I’ll hear if it floods.